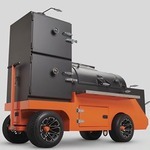 Hello Yoder Smokers Group - just purchased a new YS640 and picked up in Wichita at All Things BBQ. I live in Hutchinson, KS which is just about 12 miles from the tiny town of Yoder where these machines are made. My prior pellet grill was a Traeger Lil Tex and it did a really good job for almost everything I cooked. Was looking to upgrade to a Traeger Timberline but after researching - found overwhelming opinions on the Yoder which obviously won out. Looking forward to trading secrets with this audience of experts. Happy Smoking!